Between 15,000 and 20,000 years ago, the most recent of the glaciers in North America receded leaving a moraine of rolling, gravel hills and a deep basin which eventually became Geneva Lake. The first known inhabitants were the Oneota Indians, an agricultural people who developed a fairly advanced civilization on the shores of Geneva Lake about 1,000 B. C. They built effigy mounds (shapes of animals, such as lizards and panthers) in what is now Library Park. Unfortunately these effigies were removed several years ago. Over time more aggressive hunter tribes drove out the earlier inhabitants. Eventually, a peaceful prairie tribe, the Potawatomi, settled into the area. They named the lake "Kish-wah-kee-tow", meaning "clear waters". Their chief, Big Foot, was popular among both Indians and whites. The first white men to see this aquatic jewel were a party traveling with the family of Colonel Kinzie from the army post at Fort Dearborn (Chicago) to Fort Winnebago (Portage City) in 1831. Their personal accounts of the area generated interest among other white settlers which resulted in several families moving to the lake in the early 1830's. Following the Black Hawk War of 1831-32 many Indians in Wisconsin were removed by the United States Army to Kansas. A questionable treaty agreement with our local Potawatomis in 1833 laid the foundation for the eviction of Chief Big Foot and his tribe in 1836. John Brink, a government surveyor, laid claim to the waterfall power and adjacent land at the White River outlet to the lake in 1835. He named the lake after the lake in his home in Geneva, New York. The site of the first log cabin, built by Christopher Payne in 1836, is marked by a boulder and a plaque on Center Street just north of the river. Payne was a rival to Brink for water power rights and quite battle ensued with grist and sawmills being built in short order. Lake shore logs and many walnut trees were floated to the mills and cut into lumber from which the town was built. Eventually, flouring and wool carding mills followed. The 14 foot drop of water provided the most economical milling, and farmers brought their grain to Lake Geneva from as far away as Kenosha, Milwaukee, Belvidere, and Beloit. Our town was surveyed and laid out in 1837. Earlier land prices were $1.25 per acre. Immigrant settlers from New England and New York flooded into the town. Most came via the Erie Canal and steamboat or sailing ships through the Great Lakes, disembarking at Southport (Kenosha) or Milwaukee. Others trudged through the swamps and forest of Southern Michigan, Northern Ohio and Indiana. 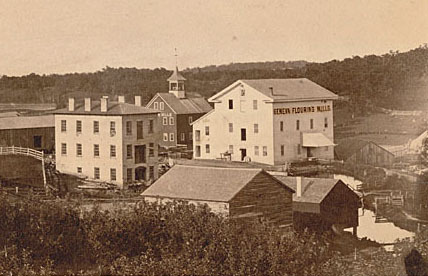 By 1840, there were two hotels, two general stores, three churches, and a distillery added to the mills, cabins and houses. In the years leading up to the civil war, Lake Geneva was on the route to the Great Lake ports for slaves escaping from Southern Illinois and Kentucky. In the early 1870's two events shaped the future of our community: The Great Chicago Fire and the arrival of the railroad. Wealthy families, seeking refuge as Chicago was being rebuilt, constructed palatial lakefront "cottages" on Geneva Lake. As this wave of affluence settled over the lake, Geneva (the early name of the village) became known as the "Newport (RI) of the West". Visitors included Mary Todd Lincoln and Generals Sherman and Sheridan. Over the years well known families such as Maytag and Wrigley developed summer estates on the shores of Geneva Lake. The construction and maintenance of these mansions, as well as household employment, developed into a separate industry in the town adding to the milling, furniture, wagon and typewriter manufacturing enterprises. The lake shore path that currently allows you to walk around the entire lake at water's edge, was frequently used by the tradesmen and domestic help that served the wealthy estates. The arrival of the railroad spurred even more rapid development of the Geneva Lake area. Not only did the railroad bring more people, but, ironically, it made possible the removal of a portion of the lake itself to distant locations. 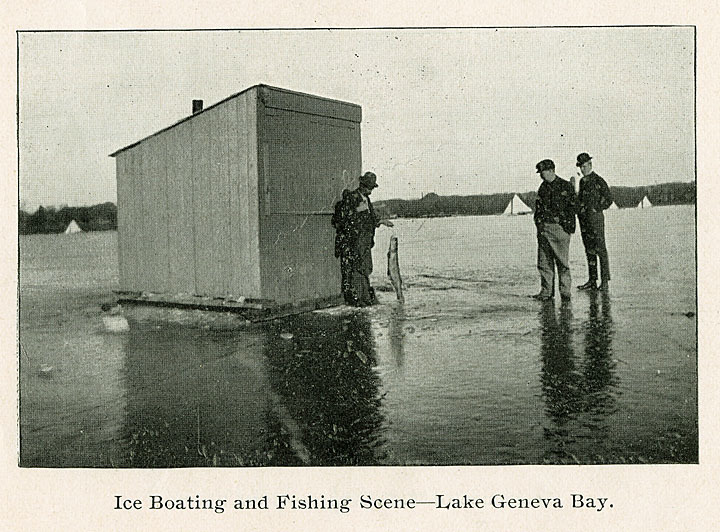 Thousands of tons of Lake Geneva ice were shipped each year to Chicago and beyond. 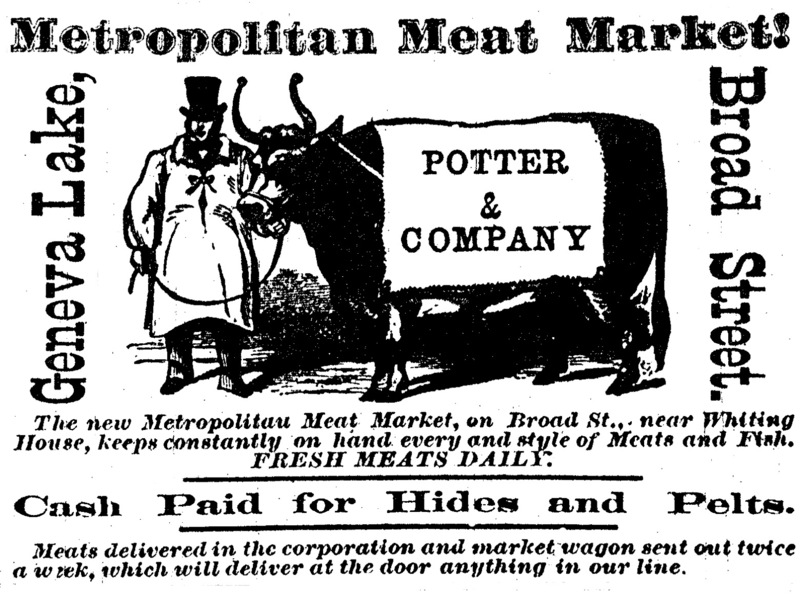 This continued well into the 20th century. Click on the words "Indian Prayer" below below to hear an Indian prayer worth thinking about. It takes a moment to load.